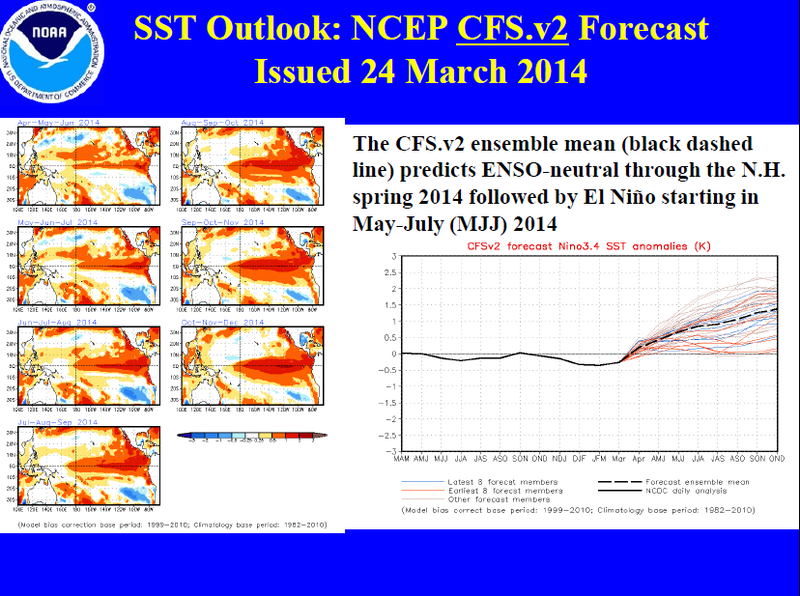 March ENSO Update – outlook suggests a moderately strong El Niño for the 2014/15 ENSO season | Watts Up With That? Eventually, some (but not all) of that warm water will rise (be drawn) to the surface. NOAA also animates those cross sections here. Weekly NINO3.4 sea surface temperature anomalies (central equatorial Pacific) have crossed zero, from negative to positive, for the first time this year. Unless something unforeseen happens, I would not anticipate them returning to negative values for at least a year, during the transition from El Niño to the trailing La Niña. Weekly NINO1+2 sea surface temperature anomalies (far eastern equatorial Pacific) are presently quite cool (about -1.0 deg C). We’ll keep track of the NINO1+2 data because the NOAA/NCEP ENSO forecast (from their CFS.v2 model) now is for a moderate East Pacific El Niño, which are generally stronger than a Central Pacific El Niño (aka El Niño Modoki). The following is page 27 of the NOAA update linked above. The NCEP GODAS website produces a number of interesting maps and they produce a monthly ocean briefing. March 24, 2014 in ENSO. Hopefully, it will give southwest USA and Texas much needed rainfall next fall-spring. I cannot see El Nino kicking in until July 2015. Better to end the drought and face an increased tropical storm risk in the Gulf than to experience a five plus year drought like in the 1950’s. It’s looking like a modoki. Temps in ENSO 1 + 2 is dropping. Central Pacific will be warm though. If you look at surface temps. the warm water is retreating (although so is the cold). Trade winds are also picking up strong. It won’t have enough juice. Nah Jim, the el nino will last until 2015 and then there will be a la nina right after cooling 2015 and 2016. In debates with warmists for about the last 10 years I was told that the next El Nino would be the one that kicks UAH above the 1998 peak. Since then El Ninos have come and gone but none were more than moderate. The question is how much above will it go? If it is a very strong El Nino, the 13 month running average should hit about 0.55 or 0.15 above the 1998 peak to continue our modest 0.1C or less per decade warming. We need to remember to point that out when the media start going off the deep end. All in favor raise your hand. It will be interesting to how strong el nino respond in the different weather regime we seem to be in since PDO, AMO, and low solar cycle. I suspect that the heat change will be very different. If the low cloud response to el Nino is smaller, I bet there’s a lot less heat flux from the ocean. I think the “el Nino” could be much shorter than a year. In fact the west-central Pacific warm water which is facing off against a comparable mass of cool water to the east, could merely serve to “prime the pump” for a much stronger following La Nina. As Jeff also noted the trades are picking up. Its high noon at the Equatorial Pacific, interesting to see which way it will go. Time will tell….. and we will learns a bit more about ‘climate predictability’ or lack thereof. 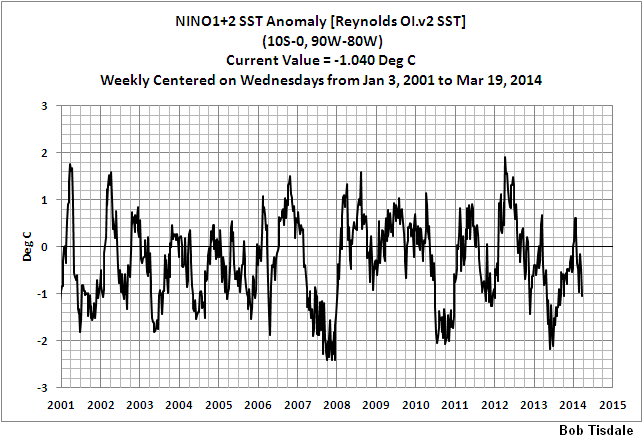 How much influence does the SOI (Southern Oscillation Index) have on El Niño or La Niña? The SOI has dropped dramatically over the past month or so. I too will be watching to see if the Weatherbell crew is correct. They suggest it will fade away after reaching a modest status, due to different factors being in control when the PDO is cold. They also suggest it will be a Modoki. Regarding next winter: A so-called “super” El Nino drives warm air right across the USA. A “modest” Modoki brings the cold air down into the east of the USA. I wonder with all that antarctic sea ice down under and the winter freeze starting , just how vigorous an el nino can it be? I for one am terrified of the coming winter here in the Noeth east USA. Terrified. Bob, great work as always. As others have noted above, there is more natural variability at work now than just ENSO. If it arises this year as you suspect, my ‘guess’ is it will have less affect than Warmists hope. Reasons have to do with all the other oceanic counter cycles currently in play. Arctic ice reforming is just one tangible marker. Ironically, California drought is another. See the USGS summary in McCabe et. al., Pacific and Atlantic Ocean influences on multidecadal drought frequency, PNAS 101:4136-4141 (2004). One would expect a reduction in the hurricane forecasts soon. 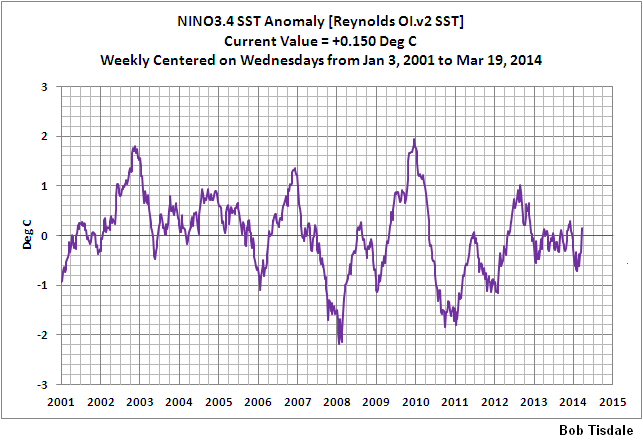 The Southern Oscillation Index is an ENSO index like NINO3.4 sea surface temperature anomalies. The SOI presents one of the atmospheric components of ENSO. It represents the difference between the sea level pressures of Darwin, Australia and Tahiti, and, as such, is related to the strength and direction of the trade winds. Its shaping up to be a large event. I guess I am hoping that there is enough cool water in the Eastern Pacific to moderate/cool off the water because the last thing the debate needs a large El Nino. But it is what it is. The equatorial cross-section is now comparable to that which occurred in the early stages of the 1997-98 Super-El Nino. Equatorial Upper Ocean Temperature anomalies are rising very rapidly (and this measure leads Nino 3.4 index by 1 to 2 months on a consistent basis). But the eastern Pacific is a little cooler overall than it was 1997-98. And the Trade Winds have not dropped off as far as they did at this point in the development of the 1997-98 Super-El Nino but they have slowed right down in the last month. Surface ocean currents are also going backwards now across a large fraction of the tropical Pacific which is part of the ENSO oscillation pattern which leads to a strong El Nino. Isn’t this the wrong time of year for an El Nino? 80% of ENSO events peak in the November to February period so it is the wrong time of the year. But there is still the 20% which occur off the typical peak periods and it does take several months for the current conditions to continue developing to reach a peak level. Overall, the current conditions are about 2 months ahead of the earliest typical ENSO timeline (but it has happened before). what are you going to say when/if it goes up by .8C to a globally averaged temperature of 1.5C anomaly temp? btw if you take the average from 1975 to now it is 1.8C/decade not 1C as you say. I well remember the winter of 97-98. Was taking evening classes in Cambridge MA, and was walking to school in shirt sleeves in February. PLayed golf the whole winter. Personally, I’m rooting for a strong one, as I can’t stand the idea of another cold eastern winter. I’m headed to Florida Keys next February, so I’m probably screwed either way down there. Moduki would be classic cold southern winter, super duper classice el nino stormy cool. really? is that what you care about, “the debate”? 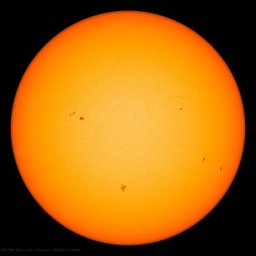 Sunspot count has been slightly elevated the past six months. A slight El Nino in 2014 would be expected. Nothing major though. A big question I’d like to see answered is how long does it take for the warmer waters to proceed up the coast of California from Central America. I have noticed in the past thirty plus years that the El Niño-like wetter winter conditions require one year to go from Southern California to Northern California. My thoughts were the same as poster #1’s: Usually El Nino means more rain for us here in Texas, while La Nina brings more drought. We’re already low for the first three months of the year; bring on El Nino!!!! CFSv2 has been calling for a moderate Nino for almost a year now. The entire time temperatures were flat and cooling, it was calling for warming. That model has no skill. Watch the trades. Definitely looks like El Nino, I’ll go for 2009-like moderate strength. If that’s the case there’s unlikely to be much warming. Imagine that, an El nino with hardly any warming-they’d be out of excuses then for sure! In any case, let’s all hope California makes the most of it. As for Ken Ring, I’d say his forecast has about as much chance as the Jade Rabbit. Yes, we are more concerned with the debater than the weather or the Climate, as it is the insane spin-offs from the debate which are hurting the whole Earth’s population, not the weather or the Climate. The weather and the Climate are just fine as they have always been, and we can adapt to warmer or cooler, but insane government legislation is much harder to dodge. It is the insane debate which is causing the damage. Nino 2014 will fizzle out. When +0.1C ENSO3.4 meets -1.2C ENSO 1+2, the candle flickers and then goes out. Theres been a lot of discussion at Weatherzone as to where this possible ENSO event might be headed. The 1997 event was kicked off by a Kelvin wave generated in December 1996 that was followed by 2 stronger waves in March and May. The initial kelvin wave in December 1996 was strong enough to push positive sea level anomalies all the way across to the coast of South America but the real strength of the event was generated by the follow up waves. This event is a little different. the initlal kelvin wave to kick of the event has come nearly 2 months later and to date has not pushed positive sea level anomalies to far into the equatorial East Pacific. Although you can certainly see some enhancement of the equatorial counter current in the Northern Hemisphere on SST charts which is something that generally accompanies El Nino events. Even though their is evidence that warmer anomalies prime the central pacific for further waves, this is offset by the fact the later we get into the year the less frequent kelvin waves are. In addition as mentioned in other posts above, the feed in from the Humboldt current is much cooler than it was in 1997. I think we are at a crossroads at the moment. If we see another strong kelvin wave develop before the end of April its hard to see us avoiding a strong El Nino event. If no follow up occurs then I see a moderate event and perhaps only a Modoki. I don’t personally see this El Nino as being likely to match the 1998 or 1982/3 ones. But we’ll see…. No one seems to have mentioned the float buoys. Aren’t around 40% nonfunctioning? Doesn’t this data gap diminish the model predictions reliability? This seems to have been forgotten, here and across the government climate prediction sources. Let’s not forget that the 98 El Nino was exceptionally strong. A moderately strong El Nino won’t have nearly the same effects. This discussion about the new El Nino made me think: alarmists use land + sea surface temperature records. When an El Nino happens warm water from the PWP is distributed across the surface. This means they will show up in the SST records but overall the heat content of the ocean hasn’t changed. If SST records do show warming after the El Nino then claiming that the world has warmed would be a false claim. The seas around Australia have been warming for the last decade thanks (I think) to the La Ninas. A mild El Nino might take the heat out of things here. It will be interesting to see. With the PDO not changing-watch out! I sure wish someone would decipher the code here. So where is this heat coming from? The cross-sectional area and the amplitude of the temperature anomaly is clearly increasing notably and is not being communicated from the surface. 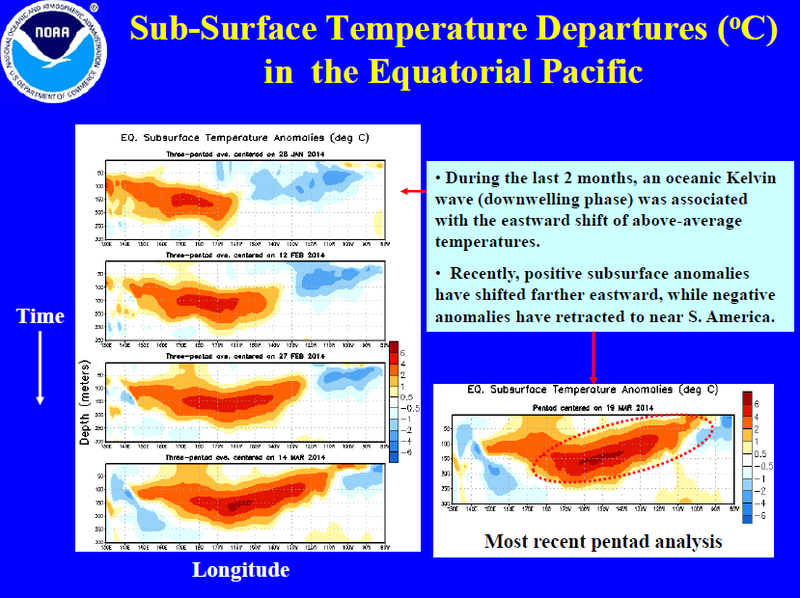 This is not just an east-west spreading of warmer water in the west Pacific warm pool. That means it must be coming form outside the band of latitudes that this graph represents. That in turn means heat energy is being moved into the tropics from either the north, the south or both. Yet further evidence that the fundamental cause of ENSO phenomena is sub-surface tidal displacement of water, not trade winds and “sloshing” as is the consensus explanation. Correlations across the Pacific show some zones are in phase with Nino34 and others are in anti-phase. This is part of a basin wide tidal oscillation at the level of the thermocline. Other than an improbably randomly driven oscillation this is probably a tidal phenomenon. If an El Nino happens late in the year, so that it is split across two years, neither of them is likely to be a record-setter. Given that the ‘hot spots’ if the below picture of sea surface temperatures are rather nicely distributed at 30 to 40 degrees both North and South of the equator in all the oceans this may indeed be some sort of run around the ends rather than a pass down the middle. I think if an El Nino was going to happen this year it would have shown itself by now (by the middle of January usually). I think we’ll be in ENSO neutral at least until the middle of July (It takes aproximately 6 weeks from solstice for change to manifest itself). We may even get a mild La Nina by October/November, giving the ocean enough time to charge itself for a moderate El Nino by the middle of next year. thats just about the dumbest comment I have ever read. Why would you use a Linear trend to predict anything? At least use some form of continuous function. No it would be an accurate description of reality, because the surface would be warmer. That the warming would be the result of ocean currents rather than directly from AGW is just how natural variations modify the AGW trend. Describing the real warming from an El Nino as false would be like describing the present pause in the trend as false because it is just a oceanic ENSO/PDO/NAO blip…. Yep. Every (every) damn time the warmista get antsy with my de-nile-ism they threaten me with the ‘next super El-Nino’ as in, JUST WAIT, YOU’LL SEE …. So, a solar driven, natural event that has been known of for centuries is somehow my fault for burning stuff ??? Oh good, only another year until the east coast thaws out. I think Greg’s point about the cause of an El Niño is important. I’ve been wondering the exact same thing. It appears the cause has to do with the warming of the subsurface waters rather than changes in trade winds or “sloshing”. These appear to be after effects once the warmer water reaches the surface. The warmer water would first cause the changes in the trade winds which would then allow gravity to push the PWP water to the east. Greg mentioned tidal forces as the cause of the subsurface warming. I suppose it could also be warmer subsurface currents from the PWP simply due to an extended period of La Niña or La Nada conditions. As the PWP warmth builds the warm water is pushed downward and flows back to the east to replace the surface currents. Any other thoughts? Baa Humbug,thats just about the dumbest comment I have ever read.Thanks. It’s actually quite a fair comment. This thread is a good chance to educate a few of our visitors who clearly are either learning about ENSO for the first time or have been indoctrinated that ENSO is nothing but noise. ENSO is phase locked, this was known by the Peruvian fishermen who first named it el Nino due to its appearence around Christmas, while this observation has none the less escaped many mainstream climate scientists. Google-scholar “phase-locked” if you’re unfamiliar with the term; combine it with ENSO and you will run into a slew of terrifyingly enlightening papers on the dynamics of ENSO as a periodically forced nonlinear oscillator. With phase-locking of el Nino peaks at winter. The current proto-el Nino is at the wrong time and under the wrong conditions and will be abortive. I dont think it ultimately makes sense to look for a single cause of el Ninos since ENSO is a chaotic-nonlinear oscillator. While under entraining influences, in general it causes itself. unless i’ve missed something somewhere, the ocean currents along the west coast run south towards the Equator, which means that it is, as i understand it, nigh unto impossible for the warmer waters to travel north. what we get here in Failifornia is the effect of the warmer waters elsewhere on our weather. redc1c4: I think there’s actually a counter-current that hugs the coast going north, especially south of Pt. Conception. So, some warmer waters from an El Nino do make their way at least that far north during an El Nino. Based on my Artificial Neural Network for ENSO studies which shows that ENSO is mainly driven by a combination of tidal forcing, magnetic forcing and by sea current inertia, I find it unlikely that ENSO is going to be in a El Niño state at the end of this year. Instead what I expect ENSO to be, is in a La Niña or neutral state at the end if this year. Of course based on the recent changes in the SOI index, the ENSO index is going to rise in the next coming 2 or 3 months. After that time I think the index is going to fall. So this is going to be an interesting test for me. Right now I’m working on making similar forecast for LOD and SOI which should improve my forecast for ENSO. In the coming following years the ENSO index is going to drift to higher values with alternating neutral and El Niño values. Expect a moderate El Niño at the end of next year. I’ve been watching the ENSO meter ever since Anthony installed it. Cool device! But I was also thinking that the meter (ENSO) might spend more time leaning towards el Niño this summer instead of leaning towards la Niña. But now NOAA goes and predicts an el Niño this year. That needle will be lucky if it’s not pegged la Niña all year. NOAA’s track record on predicting el Niño’s is terrible. One of the forecasting ensembles that the Australian Bureau of Meteorology uses is now showing a tropical storm near the Solomon Islands at the end of March with a strong cross equatorial infeed. Such a system would likely generate another WWB and make it almost certain that we will see a strong El Nino this year. The gun is currently cocked. All it needs now is the trigger. Hopefully the forecast turns out to be inaccurate (given its 5 days out). The current kelvin wave appears to have nearly run its course so if we do avoid another kelvin wave then any El Nino event wont be as strong. Any talk of a Super El Nino is just nonsense. There is cooler water already following the Kelvin Wave into the Equatorial Pacific. We would need to see follow up kelvin Waves and i can’t see any in the pipeline. Also, jamstec is firm on a modoki peaking by october. And the thing about the Cold PDO is that it doesn’t stay warm for too long. And it won’t, it will begin in the Bering Sea and feed down into the Central Pacific during the next few months. Also, 1 and 2 still look like staying fairly cool so at this stage this is going to be nothing like 1997/98, despite the warmth in the subsurface. Not forgetting also in 2012 models were predicting one also when a pool of warmth appeared in the subsurface. The pacific stated to warm and then was quickly chewed away by the cold Humboldt. Bob Tisdale himself actually produced a youtube clip of the immense Kelvin Wave of the super El Nino, showing sea height anomalies. maybe Bob you can find the post again? This one at this stage is nowhere near it. That said I’m hoping for a moderate event as we will see a thumping La nina to follow. This current warmth in the ENSO should peak by June, then fade back to the cool side of the meter by the end of summer. This coming fall should be a La Nina with a peak in Nov/Dec. After that is where an El Nino will start at the beginning of next year. That El Nino will be short lived and ENSO will then head into a multi year strong La Nina. This all assumes that the connection which I think I am seeing turns out to have validity. At least it won’t take 80 years to find out if it is right. I found that quite amusing. They were essentially saying ‘I can’t wait for the next naturally driven “warming” event so that we can we can say that human driven warming is still happening’! Thankyou for that well thought out detailed contribution. Always happy to get a response from well read contributors.